Earlier this year, Ben gave the Kev hops rhizomes, which we’ve been nurturing in pots. We wanted to give them a permanent home in a raised bed behind the garage that didn’t exist at that point. Now that it magically exists, I needed to move the hops in so they could get settled before winter. 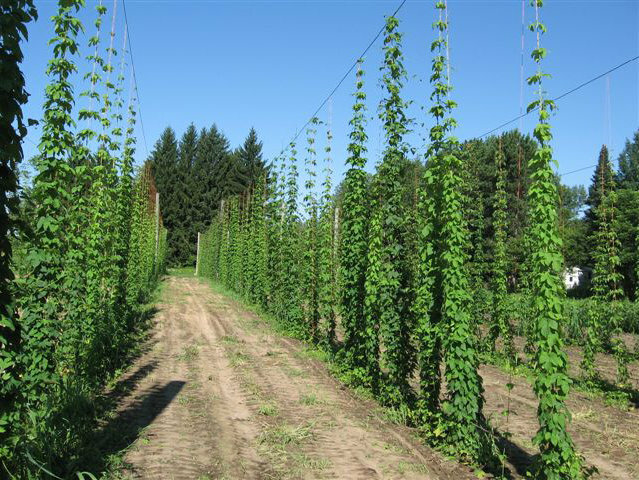 Hops are commonly considered vines, but technically, they are bines. Vines attach with tendrils or suckers, but bines simply wind around a support. Instead of needing to spread out to give tendrils or suckers new places to attach, bines can grow straight up. To harvest hops, the line supporting them is detached and laid down for easy picking. Or at least that was the theory when I planned hops for the back of the garage. Support ropes would run from the ground to the roof of the garage, giving the hops a great, full-sun location while breaking up the siding expanse. I wanted to start with five bine supports running straight up the back of the garage between the rain barrel and the compost bins. Since the lines would be 3-4+ meters tall, I wanted them to be well and truly secured at the bottom (I’ll attach hooks to the garage frame at the top). Hops support hole on the left, staking hole on the right. 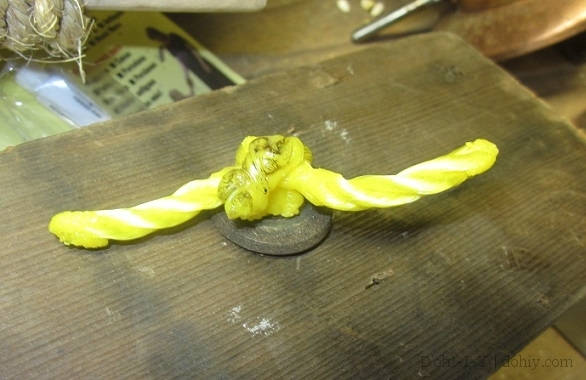 I needed loops through which to thread the ropes, and sticking with the what’s-on-hand model, I used nylon rope. 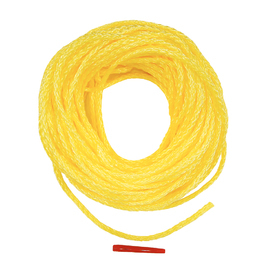 Nylon rope won’t rot under grade, and it’s nice and bright to find in the dirt. 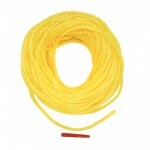 I cut lengths of nylon for each loop so that there would be about three inches above the board with a knot under it. 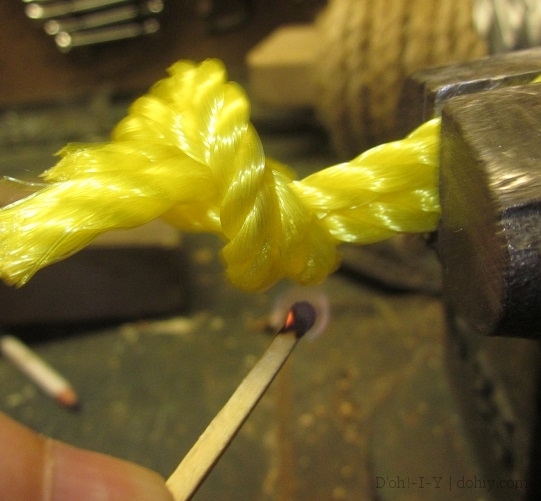 One great advantage of nylon rope is that you can bind it with heat. To make the knots secure, I melted them into undifferentiated masses of goo. I also melted the open ends to prevent raveling. I couldn’t find our campfire starter for this fiery purpose, so I used matches. I have no Match Fear since my freshman roommate took up smoking (in the hallway, which was a difference without a distinction). She was, however, scared to light a match. In a probably-annoying show of teenage bravado, I repeatedly demonstrated how Not Scary match-lighting was. Now I can light a whole birthday cake full of candles with one match in front of fretting spectators. Having roommates promotes personal growth. 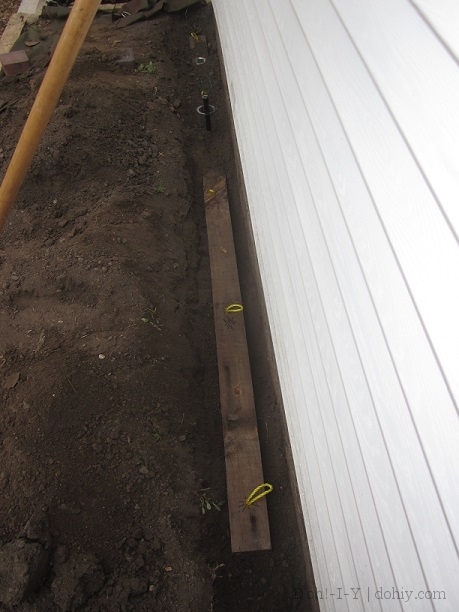 Then, I dug a trench along the garage’s base so that the loops would be just below the raised bed’s surface. Once the boards were in place, I hammered long pegs through the bigger holes to pin the boards in place. To keep track of the loops, I attached twist ties to poke up, and then I backfilled the trench. Between the weight of the soil and the stakes in the ground, the ropes will be plenty secure. 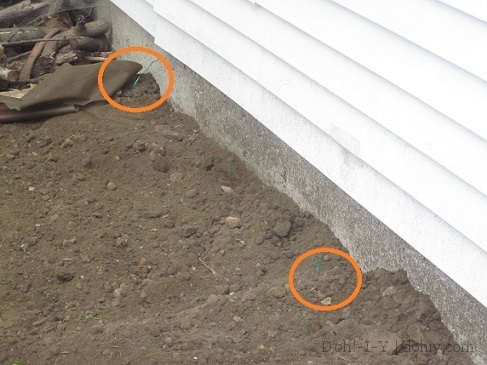 Backfilled trench with circled the twist-tie markers. 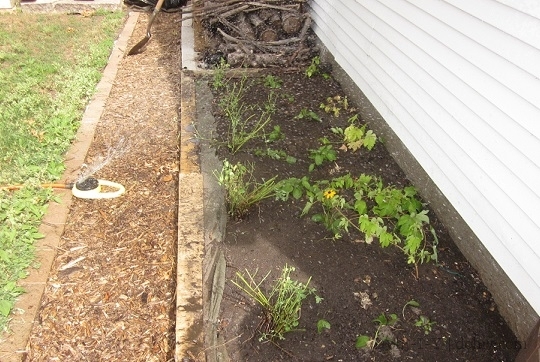 I enriched the soil with some of our home-made compost and planted the hops, along with some Black-eyed Susan seedlings and catmint divisions. I also scattered Sweet William seeds from our existing patch through the middle of the bed. Then, I watered it all thoroughly. Once it was good and watered, I topped with wood chip. 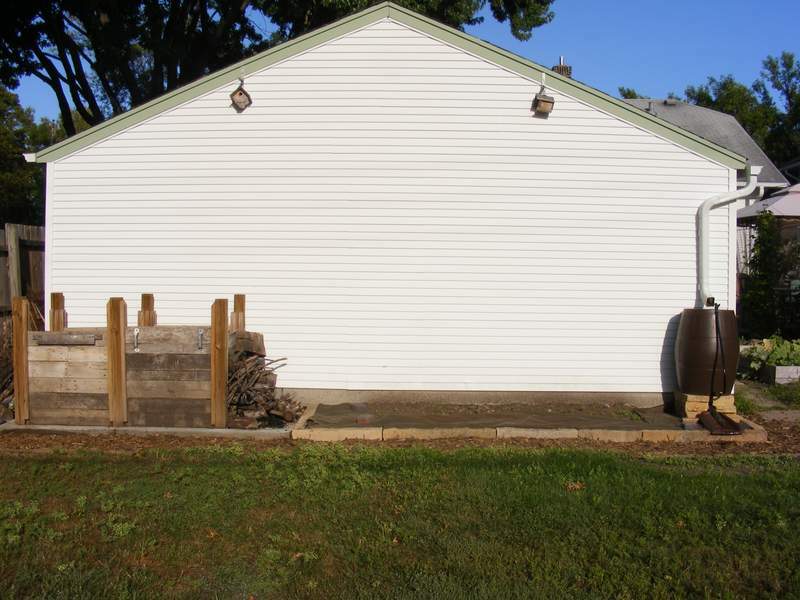 This entry was posted in Garage, Outdoor Building Projects, Yard & Garden and tagged growing hops, hops in raised bed, hops supports, hops vines. Bookmark the permalink.